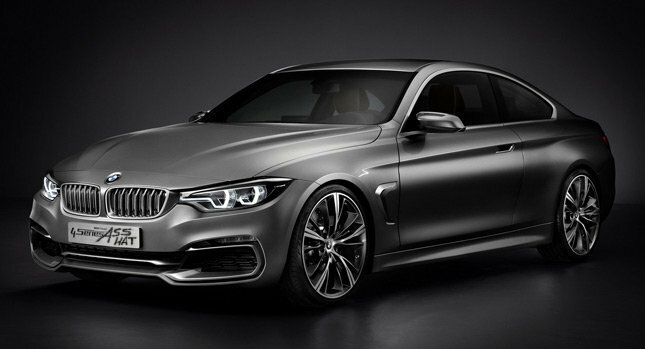 BMW today took the wraps off the first special edition of the upcoming 4-series coupe, the 428i Asshat Edition. Aimed at traditional 3-series coupe buyers, the 428i Asshat Edition features gloss black or flat gray paint, a lowered suspension, 30″ chrome-clad alloy wheels rims with 255/10R30 Toyo Spine Destroyer tires, 5,000 watt stereo with quadruple subwoofers, deep-tinted windows that automatically open when the stereo volume is above 30%, and a Smoker’s Package. Turn signals have been eliminated, as they are considered unnecessary by the 428i Asshat Edition’s target buyers. The 428i Asshat Edition will be powered by the same 240 horsepower turbocharged 4-cylinder found in the 328i, but will feature the buyer’s choice of “435i” or “M4” trunk badges. Options include Radick Cruise Control, which detects cars in the left lane, blows past them on the right, then resumes a speed 2 MPH slower than however fast that car was going. The 435i Asshat Edition will be available exclusively to single male customers under the age of 35 on a 24-month lease with monthly payments of $799 or 2/3rds of the lessor’s Home Electronics Superstore paycheck, whichever is greater.